An organization has their own domain name that they want to use that directs visitors to their Blackbaud NetCommunity website, and want to know how to configure the domain name to point to that site. Making a NetCommunity site “go live” really just means making sure that when folks on the internet type your domain name into their browser, they actually arrive at your website. To understand how to make this happen, it helps to understand what an IP address is. 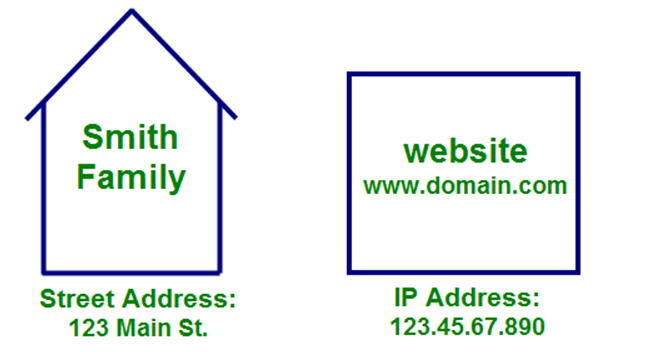 Your NetCommunity website lives on a web server and that server has a unique address called an IP address that works kind of like the street address for your home. It tells the internet how to find your website. In the example above, we have a NetCommunity website (www.domain.com) that lives on a web server with an IP address of 123.45.67.890. If your site is hosted by Blackbaud, we will provide you with your site’s IP address. If you host your NetCommunity site on your own web server, your server administrator will provide a publicly-accessible IP address for your website. When your site visitors want to visit your site, they of course aren’t going to be typing in this IP address...they’ll just type www.domain.com into their browser. So using our example, making our site live just means telling “the internet” that the www.domain.com website lives at the IP address 123.45.67.890. Making your NetCommunity site live essentially means establishing the red line above and there are two ways to accomplish this, both of which must done by first logging into your domain registrar’s control panel. Your domain registrar is the company you used to registered (or manage) your domain name. Common examples are GoDaddy, Network Solutions and Register.com but there are many others. The easiest way to tell the internet where your NetCommunity website lives is by adding what’s called an A-Record to your domain via your domain registrar’s control panel. Continuing our example, an A-Record simply tells the internet that when someone types www.domain.com in their browser (or clicks a link to this address) that what they really want is to see the website living at the IP address 123.45.67.890. Your domain registrar control panel will probably look like the image below, with multiple rows where you can enter A-Records. In this case, you are taking care of “pointing” your domain to an “Alias” address that Blackbaud provides and Blackbaud will always make sure that the Alias points to the correct IP address (even if we have to change the IP address down the road). Adding a CNAME record isn’t much different than adding an A-Record.